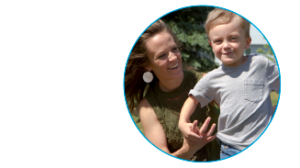 For the first year of his life, Gavin’s parents tried many methods to treat his recurring pneumonias, from different oils and medications to chest physical therapy. Treatment is incorporated into Gavin’s daily routine, twice a day in 30-minute increments. When Gavin starts to get even the smallest cough or sniffle, he uses his vest up to four times a day to combat the mucus. The positive impact on Gavin’s health makes the time spent worthwhile. “It’s not a hindrance to our life. It just enhances his life,” Allison said.